The patent was granted to a novel material structure, for improving skin appearance and wrinkle reduction. 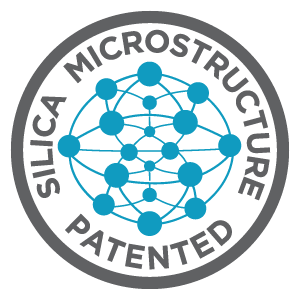 The material is composed of microstructres made mostly from silica tiny particles. These microstructures resemble small spheres, filled with either air or liquid, and made of double layers of silica tiny particles. Other microstructures resemble ligaments, and other are a kind of hydrogel in which the other structures are suspended. Some particles are hydrophilic, namely water-loving, and some hydrophobic, or water repelling. This duality grants special properties to the cosmetic composition made of the material: it has high affinity to the skin (which has watery and oily zones), so it remains on the skin for many hours, as an invisible layer, even after washing the skin. The material contracts after spreading, and provides the appearance of flattening wrinkles.